I love Russian films. For me, the experience of watching films from Russia is quite singular – whether they’re classic or modern, from the Soviet era or recent times. It feels like the films have arisen out of a very specific cultural context that sets them apart from others, a context which I find extremely intriguing. If you’re a fan of Russian cinema like I am, you should definitely check out the Russia in Classic Film blogathon over at Movies Silently. 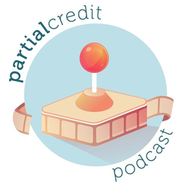 The blogathon is running from the 8th until the 10th of March, and there have been so many amazing films and topics chosen. 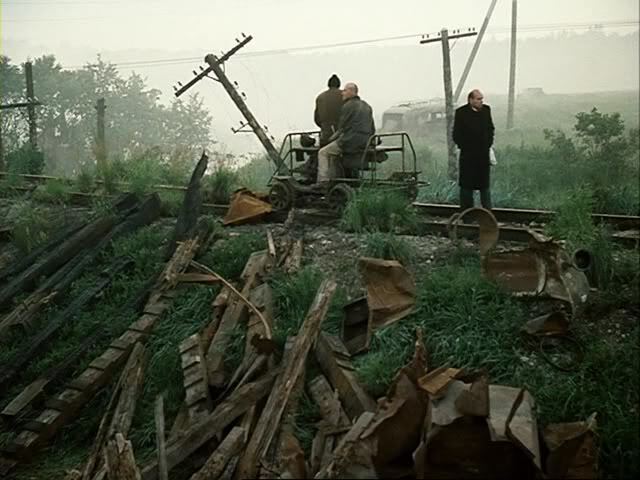 I chose to review a Russian film that I have always meant to watch – Andrei Tarkovsky’s Stalker (1979). Set in a time where a meteorite has struck the Earth and created a mysterious pocket of land called the Zone, Stalker follows three men – the Stalker (Alexander Kaidanovsky), the Writer (Anatoly Solonitsyn), and the Professor (Nikolai Grinko). People are forbidden from visiting the Zone, and many are scared of what it contains. The Stalker is the only person who is able to safely navigate it and assist people with finding the Room, a place where it is said that one’s greatest wishes can be granted. The Stalker leads the Writer and the Professor on a quest to find the Room, navigating a confusing and life-threatening terrain whilst simultaneously exploring their own psyches and testing their own beliefs about life. You could say on one level that Stalker is a sci fi thriller, where two men are being led on a mysterious quest, to an otherworldly land, in order to attain their wildest desires. 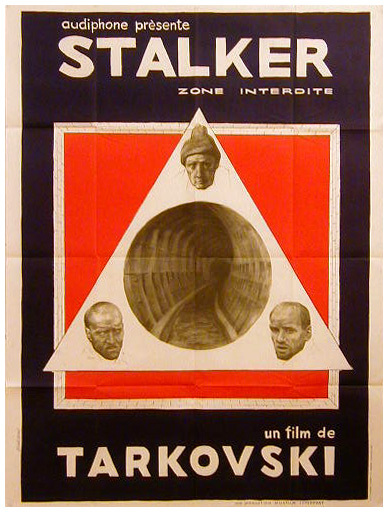 However, on a deeper level, Stalker is a highly introspective and psychoanalytical thriller, where the men wander a strange landscape in order to not only attain their wildest desires but also understand themselves and their underlying motivations better. The quest for the Room is also a journey through their subconscious, a journey which becomes more intense the closer they get to their destination. The men come to understand that maybe their assumptions about life, death, and the universe may be incorrect, and this understandably causes them a great deal of anxiety. This type of intense hypothesis-testing is rare to see, but is quite common in Tarkovsky’s characteristically cerebral works. The three main characters, who are only given nicknames, are all performed in very subtle ways. At times they are difficult to tell apart because they all look vaguely similar. But the Stalker always sticks out, as the leader of the quest and the only one not physically able to enter the Room. Some of the dialogue is very intense and psychological, and it is to each actor’s credit that it never becomes boring. True, the pace of the film is very slow, but I found that the dialogue and the actor’s performance of it kept my interest very nicely. Another excellent performance is that of the Stalker’s Wife (Alisa Freindlich), who is only on screen for two and a bit scenes, but whose performance is so intense in each (particularly her final monologue which is delivered directly to camera) that it is quite unforgettable. Aesthetically, Stalker is a treat for the ears and the eyes. Tarkovsky is fast becoming one of my favourite directors of all time. His use of slow panning shots to take in an environment in its entirety and to reflect on the totality of a scene is put to good use here, with so many visual elements for the viewer to focus upon and consider in terms of their immediate effect on the characters and their quest. Shots that are set outside of the Zone are filmed in a monochrome sepia colour with what looks like overexposed film, and inside of the Zone, we are treated to gorgeous natural colours that seem totally unnatural after seeing what life outside of the Zone looks like. The terrain inside the Zone looks like nature has overtaken a country town, with vehicles and buildings decaying and overgrown. The overall effect is so beautiful, in a macabre fashion, and also supremely intriguing. The sound design is fantastic and extremely creepy. Before entering the Zone, each sound effect has a strange resonance that makes it feel somewhat alien to the ears; the droplets of water sound somewhat crunchy, pieces of glass or dirt cracking beneath the characters’ feet sound like the whole earth is breaking up. The sounds are pronounced and threatening. When the characters enter the Zone, as their world opens up into a wash of colour and nature the sounds become softer or more natural, but the frequency of a strange twanging musical effect increases, and the dichotomy of the two is disturbing. This element of the sound design indicates to the viewer that there is danger both inside and outside of the Zone. Only once the characters have reached the entrance to the Room does the sound of water seem normal and almost calming. The sound design is frankly quite genius, being very effective at creating a sense of unease and tension throughout the entire film. What can one say about the ending of Stalker? It’s strange, stranger than the rest of the film. But it seems like a fitting way to end a film about reaching the limits of one’s own psyche and ability – with another character (no spoilers here), who exceeds the audience’s expectations of them, to show a brief glimpse of their own hidden abilities. 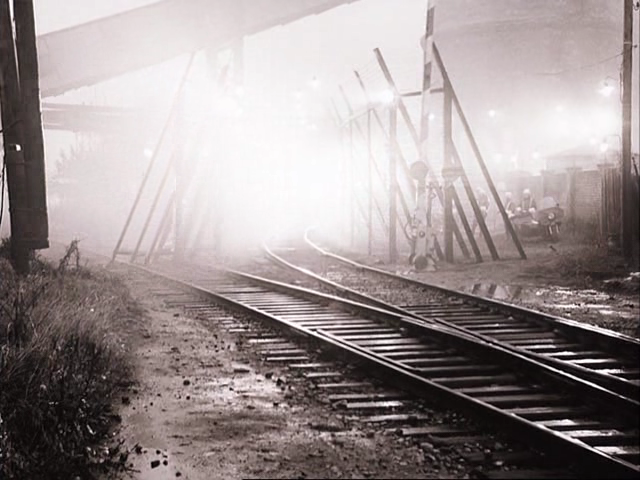 It’s an image that Tarkovsky rests upon and forces us to watch, which initially made me think – why did he save this until last? It’s a mystery that we’ll probably never truly understand. Which brings me to my next point: the way that this story unfolds insinuates so many different interpretations of it that what results is something truly personal to each viewer. I would hazard a guess that each viewer of this film would have a different perspective on what it all truly means, which I absolutely love. Stalker will be too slow of a film for many film-watchers, this I know for sure. It is laborious and introspective, and the pacing is indeed quite slow. But Stalker rewards its viewers for paying attention and for listening to the characters’ ruminations on life and their individual situations. The idea of a Zone brings to one’s imagination the history of Russia, the gulags, the espionage and state secrets, which makes Stalker a uniquely Russian film – in addition to the fact that its bleak and unflinching gaze on the protagonists and their own predicaments seems to recall the common themes of the country’s literature. 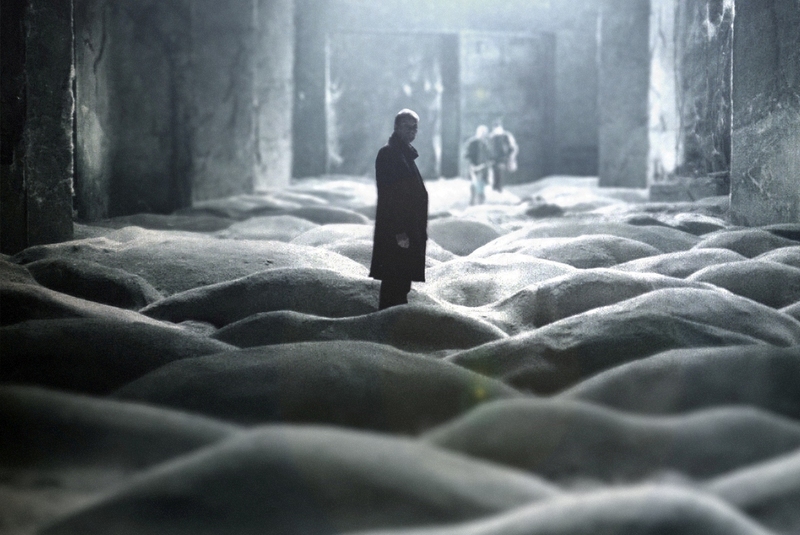 Andrei Tarkovsky is a genius, and Stalker is quite an amazing film. Watch the trailer here (no English subtitles, but worth a watch anyway). Thanks Cindy! 🙂 Tarkovsky is certainly amazing, definitely a director to check out! So – to sum this up – you’ve been stalking me???? Totally spooky, they shouldn’t have been shooting in such a dangerous place! This is such a wonderful film. I think best films to start with Tarkovsky are this and Solaris, as they are easier to understand than his even more challenging films. I would definitely agree with that! You have to start somewhere with such an amazing director and those two are the perfect places to start. I love Russian literature for exactly the reason you stated in the first paragraph. And I generally get along with slow films, so I bet I’d like Stalker, too! I would be really interested to hear your take on it! It’s such an intriguing and strange piece of cinema. Thanks for posting a link to the trailer – I love the look and feel of this film. If I get the chance to watch it, I will reference your thoughtful post as a reference. Thanks! Thanks so much for joining in! I certainly will not argue with you about Russian film, they truly are magical. I appreciated your atmospheric review. Thanks so much, glad you enjoyed! 🙂 What an amazing blogathon, have loved reading everyone else’s pieces! I love that this blogathon has introduced me to so many new gems, and great to find a new(er) movie among them. This sounds like a challenging and thought-provoking watch – sometimes you just need some introspection! Absolutely! It is quite a challenging film overall but it is well worth the watch. I added another one to my list. I don’t remember this playing in the San Francisco area. Thank you for sharing with all of us.